Jack Klugman, Garry Walberg, John S. Ragin et al. Join four-time Emmy nominee Jack Klugman as L.A. Coroner Quincy, who has an unusually active role in police investigations as he delves deeper into what happened to a body - before and after a crime. Not content with surface evidence, Quincy uses forensic science to delve further, in a passionate and dedicated attempt to bring the perpetrators of crime to justice, managing to always be at loggerheads with his superiors along the way. 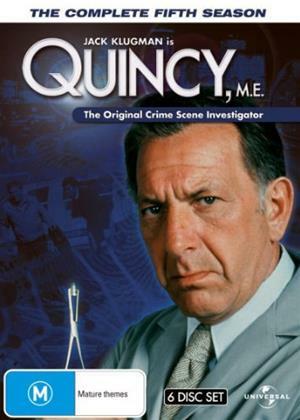 Long before the CSI franchise, Jack Klugman was televisions pioneering forensic investigator. So popular with audiences, the series aired for eight seasons, tackling many social issues for the first time on television, inspiring a new genre of medical dramas focusing on realism as much as human interest. An whilst being a crusader for reaching the truth, Quincy was also quite the ladies man, with the serious drama tempered with light comic touches.